Rolo Pretzel Cookies - C.R.A.F.T. Baking is not my forte, which is one of the reasons I love these 3 ingredient cookies! I’ve made the pretzel cookies dozens of times and they are always a winner, I think it’s the salty sweet combo! 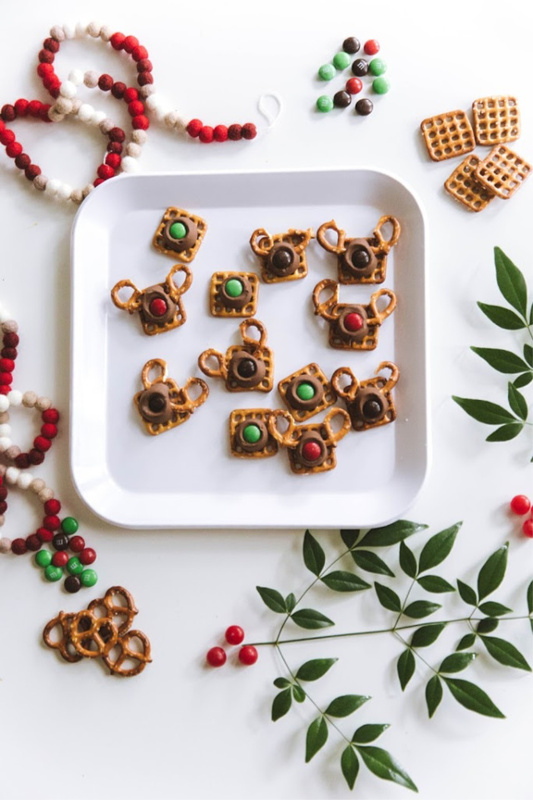 So, when Natasha from House of Nicholes asked me if I’d like to join her cookie hop, these adorable reindeer cookies with pretzel antlers came to mind! I also love these Rolo pretzel cookies because you can easily change the colors to coordinate with any event. You can even switch out the Rolo for a candy melt to change the color combo. You can see how I did that for a book inspired baby shower and made 3 ingredient cookies into Green Eggs and Ham cookies. I’ve also made a “healthy” version of the pretzel cookie and added a pecan. This time I decided to really spice them up, and added antlers. Adorbs, right?! Blast on the Chrsitmas music and get ready for a candy unwrapping extravaganza! Seriously though, these cookies are 3 ingredients and could not be easier to make. Preheat the oven to 250 degrees, then line a baking sheet with tin foil or parchment paper. Who wants to clean the pan? Not me! Next, lay out as many square pretzels as you can fit onto the lines baking sheet. This is my least favorite step in the process. If you have a 4 year old, this is the perfect step for him. My son loves unwrapping and inevitably eating a few Rolos as he works. As the 4 year old un wraps the Rolos, place one on top of each square pretzel. 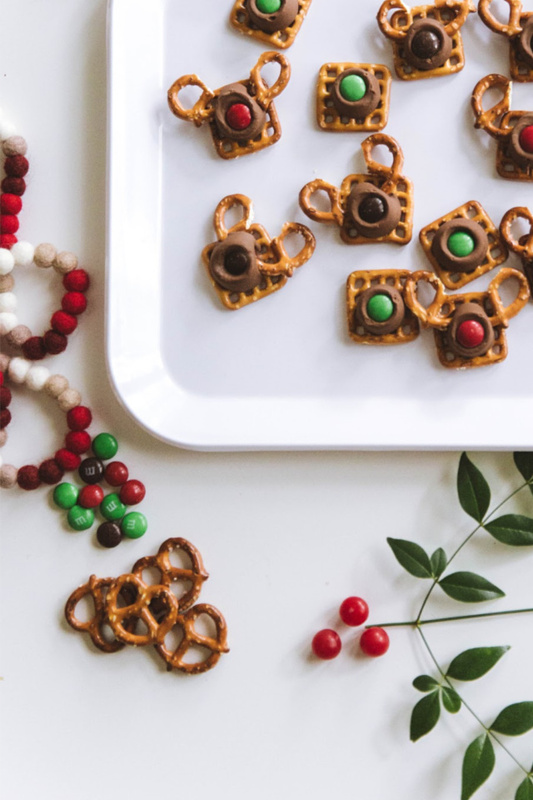 This is the most delicate task of the reindeer pretzel cookies! I recommend using a serrated knife and slowly cutting the mini pretzels in half. Patience is key. Don’t stress too much, all antlers are made different! Once all of the antlers are made, place the baking sheet in the oven for 3 minutes. You want the Rolos soft enough so that you can easily stick the antlers into the Rolo. 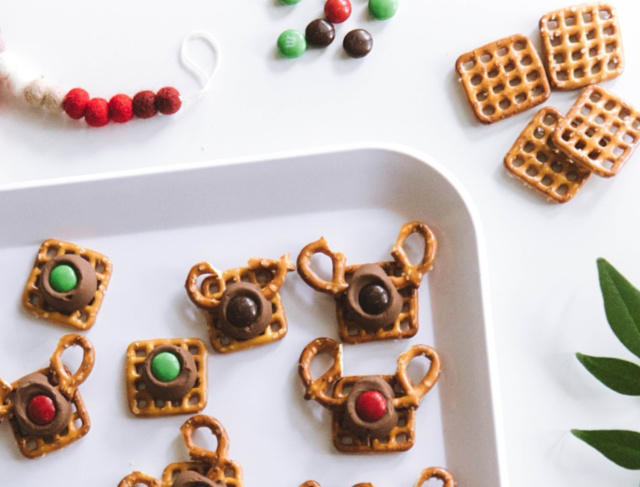 Pull the baking sheet out of the oven and begin sticking antlers onto the sides of the Rolo. Next, add a red or brown M&M to the center of each Rolo. I decided to make a few green pretzel cookies sans antlers. Let’s be real, the green addition makes the tray look cuter. Now for another fun surprise, here are 12 more scrumptious cookie recipes to get your holiday baking off to the right start! Be sure to hop and over and check them all out! Have you ever made a version of the pretzel cookie? They’re cute and tasty and easy, therefore one of my very favorite cookies to make! These look as fun ad whimsical as they look totally festive and delicious! I love the simplicity of this off the beaten path holiday cookie recipe. Thank you!